If anything can drive the spirits away, it’s Dennis the Menace. Clearly not every copy got that sticker slapped on the cover, as per, again, that scan on the GCD. And this is the kind of sticker that ain’t comin’ off, so it’s not like someone got one of these and removed it. 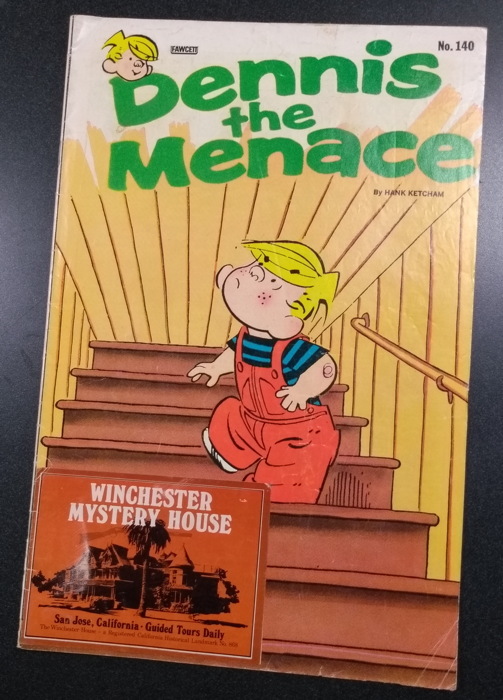 My guess is that stickerless copies were given out at the Mystery House itself, while stickered copies were used as advertising elsewhere, with the sticker making it clear that the point of being handed the comic was “oh, yeah, the Winchester House,” not “here’s Dennis the Menace, now available in comic book form…enjoy!” I have no idea…maybe copies were just randomly stickered. Only the Winchester House spirits know for sure. Interesting. I notice from the GCD that Dennis the Menace #159 had a “Half Moon Bay Pumpkin Festival” variant–but those appear to be the only two issues in the whole run with tie-ins like that. 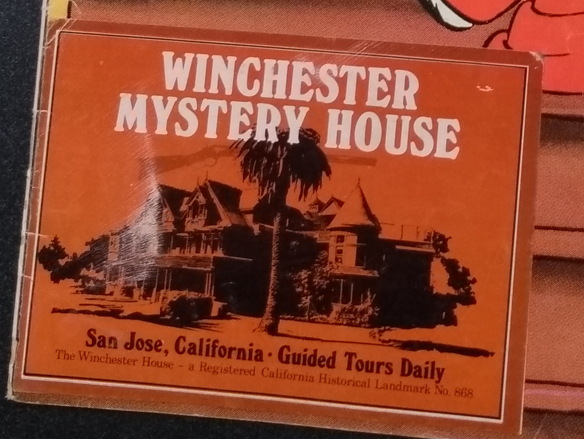 Why the Winchester Mystery House? Did Hank Ketcham simply once visit there and like it? Or did the Mystery House approach him, or Fawcett? I also checked the Dennis the Menace Giants (https://www.comics.org/series/11132/) and found no similar tie-ins, although I’m now intrigued about the Dennis the Menace in Mexico issue. I also had at the shop a while back a Dennis the Menace issue that was all about their visit to Universal Studios. Maybe an additional source of income subsidizing the Dennis pubishing empire? Or possibly they gave out comics and stickers, and one kid happened to put the sticker on his copy? Something tells me Mr. Wilson financed the Mitchells’ trip and he was very disappointed when the boy came back alive. A Half Moon Bay Pumpkin Festival story? So…the stage has been set for a Dennis the Menace/Birdemic crossover! Hank Ketcham lived in Monterey for years, which presumably helps explain why Dennis visited the Mystery House, the Mystery Spot, and Half Moon Bay (though of course he also went to plenty of real places not located near Ketcham’s home). Monterey’s Dennis the Menace Playground, funded by Ketcham, has been there since the 1950s and remains very popular. I meant to say I thought the two stories appeared in one comic.